For those wondering what the last year of Star Wars comics under Dark Horse will look like, here’s a projection of what we can expect so far. Yesterday Leland Chee Tweeted that the Story Group at Lucasfilm has full control on what is and isn’t canon in the Star Wars Universe. That in and of itself has spawned a plethora of stories across the interwebs today. But I’m going to take you farther down the rabbit hole, I’m going to show how what Leland Tweeted yesterday opens up a whole new can of worms. The big news out of the Star Wars Rebels New York Comic Con 2013 panel was the reveal of the bad guy for the show: the Inquisitor. But what is an Inquisitor? If you’ve watched the films and even Star Wars: The Clone Wars, such beings are never mentioned. Up until this point, Inquisitors have only showed up in the Star Wars Expanded Universe such as the books and the video games. So just who are these Inquisitors? According to Contactmusic.com, J.J. Abrams revealed that Star Wars Episode VII will have a central love story. Of course there are a ton of possibilities. We could see Jaina Solo hooking up with someone new. There could be two completely new characters involved in some Jedi love story. Or, we could see what we’ve all been waiting for, the Leia and Chewbacca forbidden romance. Search your feelings, you know it be true. Thanks go out to Jedi News for spotting this intriguing piece of news. Star Wars artist Joe Corroney teased fans on his Facebook page about a new Star Wars project. 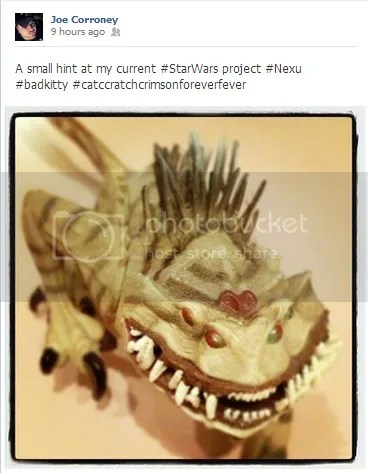 It looks like we should be expecting Nexu…will that include Allana as well? Star Wars artist Chris Trevas recently revealed on Facebook that he and fellow Star Wars artist Chris Reiff have begun work on two new Star Wars projects. 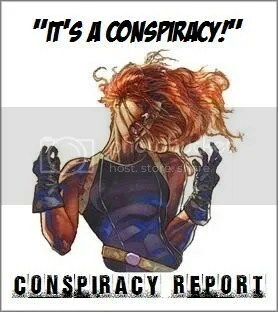 Chris Trevas and Chris Reiff working on two new, mysterious projects…it’s time to fire up the conspiracy wheels. First, let us begin with the hard evidence. 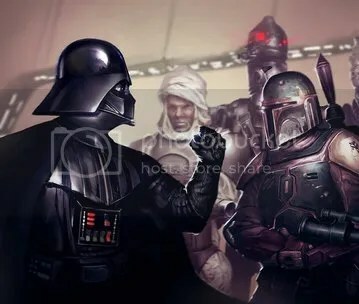 No Disintegrations: Did Boba Fett kill Owen and Beru Lars?